Share your whole stack, on any cloud, with one workflowThe easiest way to share and organize Manifold-managed resources and secrets. At Manifold, we’re dedicated to helping developers find, organize, and connect the best services to their applications. We recognize that developers are naturally collaborative and need a way to organize and visualize how they share their projects, which means making sure Manifold works effortlessly with teams. We would like to introduce you to Manifold for Teams as the easiest way to share and organize Manifold-managed resources and secrets. Building applications is collaborative, and when relying on cloud services for core functionality you need to be able to share access to those services. The problem is each service comes with its own flavour of access control and collaboration, and you’re stuck hunting down several invoices at the end of each month. 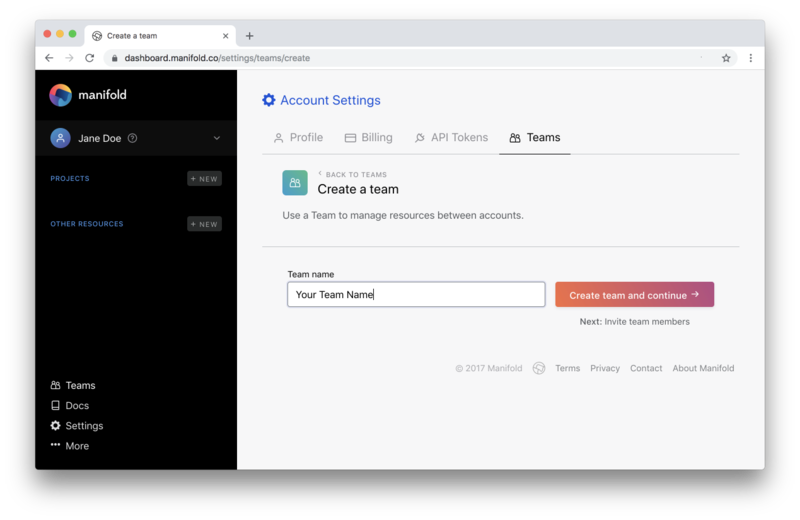 With Manifold for Teams you receive one bill at the end of the month, and share access to all of your resources and secrets with a single invite. Gain peace of mind through granting users access to only what they need, whether that’s running your application with credentials or being able to purchase and configure new products. Reserve your team’s namespace by visiting your Manifold Marketplace dashboard. Then head over to our documentation and check out our getting started guide for teams, or read how to use teams in the command line.